Democracy depends on the ability to end others’ lives before they’re even born, according to one famed feminist. Netflix released a trailer for its new documentary, Reversing Roe, on Sept. 4. The timely teaser for the abortion law film comes during Supreme Court nominee Brett Kavanaugh’s confirmation hearings. The film hits computer screens Sept. 13, and appears to include interviews with abortion activists including Gloria Steinem. The trailer gave a sneak peak of her comments. “It’s the basis of democracy, that you control your own body,” she said in the film worried about Roe v. Wade, the 1973 Supreme Court case that legalized abortion in the U.S. This comes as many in the media panic that Kavanaugh could enable the court to overturn Roe. 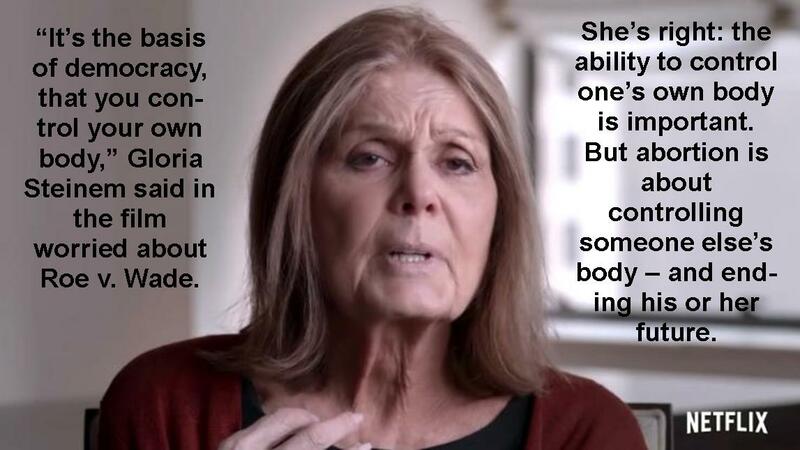 She’s right: the ability to control one’s own body is important. But abortion is about controlling someone else’s body – and ending his or her future.